German-American rabbi, Talmudist, and author; born at Worms, Germany, Dec. 3, 1809; died in New York, June 9, 1891. From his father, Isaac Adler, who had been one of the dayyanim, or associate rabbis, in Worms, young Adler received his first instruction in Hebrew and in the Biblical and post-Biblical literature of the Jews. When Rabbi Isaac Adler died (Dec. 23, 1822) he left his widow and five young children in straitened circumstances. Samuel, though then but thirteen, in spite of innumerable difficulties and extreme privation, continued his studies at the yeshibot (Talmudical colleges) in his native city and in Frankfort-on-the-Main, pursuing at the same time regular classical and general studies at the high schools of those cities. After graduating from the Frankfort Gymnasium, Adler entered, in 1831, the University of Bonn and later that of Giessen, where, in 1836, he received the degree of doctor of philosophy. His first official position was that of preacher and assistant rabbi in Worms. In 1842 he was elected rabbi of the Jewish congregations in Alzey and its neighborhood, and he remained in this position until 1857. About the beginning of that year he received a call from the congregation Emanu-El in New York, as successor to Dr. L. Merzbacher, who had died a few months previously. Adler accepted the call, and in March, 1857, entered on the duties of his office. He remained active as the spiritual head of this congregation until 1874, in which year he was made rabbi emeritus and relieved from active work for the rest of his life. G. Gottheil was his successor. Samuel Adler was not merely a thorough Talmudical scholar; he was also a master of the entire field of knowledge concerning the Jews. Whatever had any relation to his coreligionists—their history, religion, literature, etc.—interested him and was studied by him. He was not only a scholar, but also a man of vigorous action. During the twenty-one years of his career in Germany he took part energetically in the efforts at that time being made to remove the civil disabilities of the Jews, especially the oath more Judaico. He succeeded in obtaining the introduction of the teaching of the Jewish religion in the lower and higher schools of Worms on equal terms with Protestant and Catholic teaching. He labored earnestly to secure the recognition of the equality of the sexes in matters of religion. It was through his influence that the barrier was leveled which had separated the women's synagogue from that of the men in the ancient synagogue of Worms. He gave his special attention to the improvement of the religious instruction of the young, both in the city and in the rural schools of which he had the supervision. He made it his aim to enhance the order, the solemnity, and the dignity of the public worship. He was instrumental in founding a number of new charitable institutions. Above all, he labored with patient zeal to instruct the congregations under his charge in their ancestral religion, to liberate them from the deadening influence of literalism, and to quicken in them the spirit of Judaism. In this endeavor he frequently drew upon the storehouse of his great Talmudic learning for the arguments which he used in his struggle for progress, seeking always to rest the reformation of manners upon a basis of inward conviction, and favoring a gradual transformation rather than an abrupt transition from the old to the new. He attended the three great rabbinical conferences held in Brunswick (1844), Frankfort-on-the-Main (1845), and Breslau (1846), respectively, and took a notable part in their proceedings. 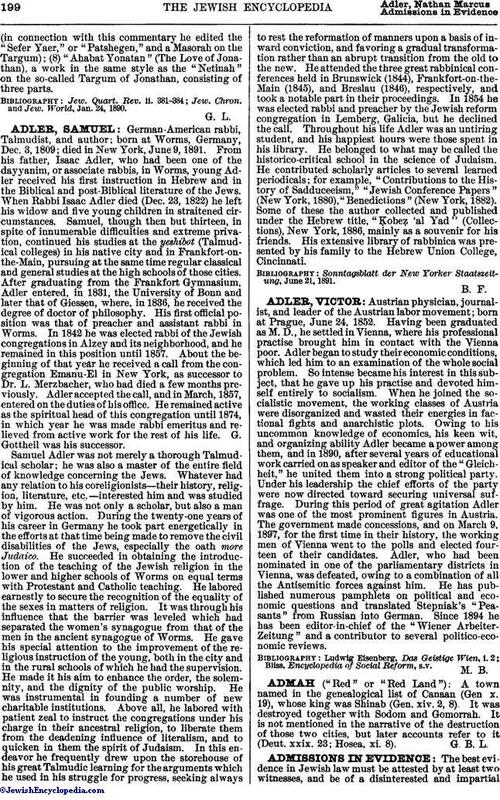 In 1854 he was elected rabbi and preacher by the Jewish reform congregation in Lemberg, Galicia, but he declined the call. Throughout his life Adler was an untiring student, and his happiest hours were those spent in his library. He belonged to what may be called the historico-critical school in the science of Judaism. He contributed scholarly articles to several learned periodicals; for example, "Contributions to the History of Sadduceeism," "Jewish Conference Papers" (New York, 1880), "Benedictions" (New York, 1882). Some of these the author collected and published under the Hebrew title, "Ḳobeẓ 'al Yad" (Collections), New York, 1886, mainly as a souvenir for his friends. His extensive library of rabbinica was presented by his family to the Hebrew Union College, Cincinnati. Sonntagsblatt der New Yorker Staatszeitung, June 21, 1891.